"If they had not acted so fast, I would not be with her on my lap today." The last day of 2017 nearly ended up being this little dog’s last day on Earth. Spooked by the sound of fireworks, she tried to escape by crawling through the railings of her home’s fourth-story balcony — and was soon forced to cling for her life. But thanks to the actions of neighbors below, tragedy was avoided. The dog, named Tina, lives with her owner in Goiânia, Brazil. She'd been left alone for just a few minutes while he stepped out to go to the store. But in that short time, she found herself in a world of trouble. 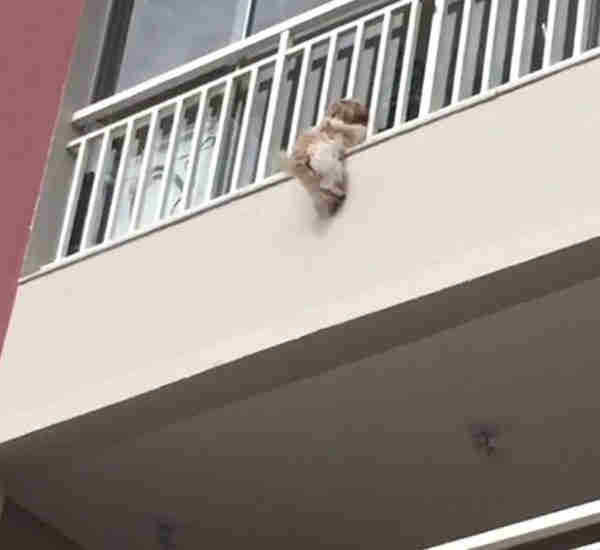 Neighbors who were having a cookout down on the ground floor noticed that Tina was hanging off the balcony overhead. The dog's fall appeared to be imminent, so without hesitating, the Good Samaritans hurriedly fetched a sheet and held it taut beneath her. They did so without a moment to spare. This heart-stopping video captured the moment Tina then slipped — and was caught before she hit the ground. 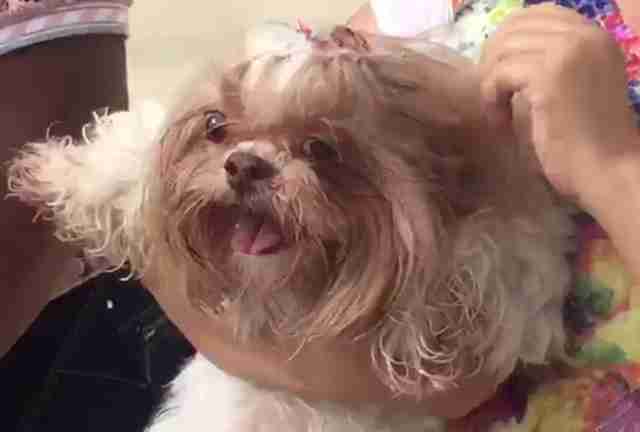 Aside from being understandably shaken by her near-death experience, the 11-year-old Shih Tzu was unharmed. Tina's owner, Jean Carlos Silva Siqueira, who arrived home shortly after, knew just the people to thank — telling a local TV station: "If they had not acted so fast, I would not be with her on my lap today." While fireworks can certainly be a lot of fun for people, they can be quite scary and traumatic for pets. Here's a simple trick to help keep your dog calm.